You spend a lot of time in scrubs, so it makes sense that you want your scrubs to flatter your body type and be fashionable. We’ve picked seven of the most common body shapes (big chested, pear-shaped, full-figured, petite, tall, long-waisted, and athletic) and found scrubs that’ll look great on each. Now find your shape…and see the scrubs that highlight your best features. Go for one color. Avoid big prints and opt for simple-colored tops and bottoms in one color that will make you appear longer and slimmer. Buy a great bra. Providing “the girls” with proper support will make your torso appear longer. Take advantage of fittings by bra experts at your local department store. When buying scrubs, check your cleavage by bending over in front of the mirror to see if too much might be showing. Another good way to check is that if you can look down and see your cleavage, so can others. Get tailored. 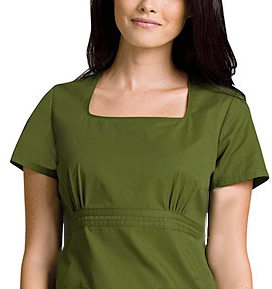 Getting your scrubs altered so that they fit well will provide a better silhouette and be more flattering. You can also help establish a stronger vertical line with side stretch panels. Draw the eyes up: A show of skin at the neck or chest can shift the focus from the body to the face. Try a patterned or brightly-colored top, paired with dark, plain bottoms, which help you look slimmer. Go for definition: Highlight the narrowest part of your torso with a band under the breasts or empire waist. Elongate your legs: Pants should fall in a straight line from the middle of your bottom to your shoes so that your leg line provides a straight, long line. Keep your shoes the same color to keep the visual line unbroken. Keep it simple. Darker tones can take off pounds. Leave off the jacket. A jacket or sweater can make you look bigger, so wear a sleek, dark undershirt beneath your scrubs if you need the warmth for these cold months. Flatter yourself. Empire waisted scrubs that hug your bust then flare out from your body can be a great way to provide definition to your body. Stay in proportion. Don’t choose big prints that can overwhelm your smaller frame. Your top should hit just below your hips. A monochromatic look – a top and bottom in the same color – can make you appear taller. Show some skin. In order not to appear overwhelmed by your clothes, try a v-neck top or other flattering neckline where your collarbone is exposed. Use small jewelry. Don’t wear over-sized earrings or other jewelry such as watches. Big accessories can overwhelm a petite frame.